Cranberry Scones have a crisp outside crust yet are wonderfully soft and flaky inside. You can use fresh, frozen, or even dried cranberries. You can add some orange or lemon zest, chopped nuts, or during the Christmas season you can add some candied mixed peel. These Cranberry Scones have a light, almost bread-like texture and that is because the batter does not contain eggs. Milk or cream is used to bind all the ingredients. You can use full fat (whole) milk or cream depending on how rich you want your scones to taste. As I said above fresh, frozen, or even dried cranberries can be folded into the scone dough. Although I really like the tart flavor of fresh or frozen cranberries, dried cranberries provide a wonderful sweetness and chewiness. 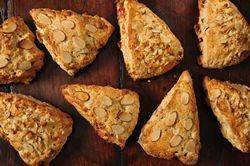 The scones are baked in a hot oven until nicely brown and a toothpick inserted in the center of a scone come out clean. They are especially good warm from the oven, and you can enjoy this scone on its own or in the traditional way with butter, Devonshire Cream and either jam or lemon curd. Cranberry Scones: Preheat your oven to 400 degrees F (200 degrees C) and place the oven rack in the center of the oven. Butter or line a baking sheet with parchment paper. In a large bowl, whisk together the flour, sugar, baking powder and salt. Cut the butter into the flour mixture with a pastry blender or two knives. The mixture should look like coarse crumbs. Gently stir in the cranberries making sure not to crush the berries. Add the milk and stir until just combined. Do not over mix. Transfer to a lightly floured surface and knead the dough four or five times and then pat, or roll, the dough into a circle that is about 7 inches (18 cm) round. Cut this circle into 8 triangles. Transfer to the prepared baking sheet and then brush the top of the scones with milk or cream. If desired, sprinkle with sliced almonds. Bake for about 17 - 20 minutes or until the crusts of the scones are brown and crisp, and a toothpick inserted into the center of a scone comes out clean. Remove from oven and place on a wire rack to cool. Excellent plain or you can serve with butter or Devon cream.